When it comes to creating a family cookbook, there are so many things to consider: how many recipes to include and what format it should take are just two of them. My mom and I are in the process of creating our own family cookbook, and so when an editor at Costco Connection asked me to write a story on the topic, I jumped at the opportunity. 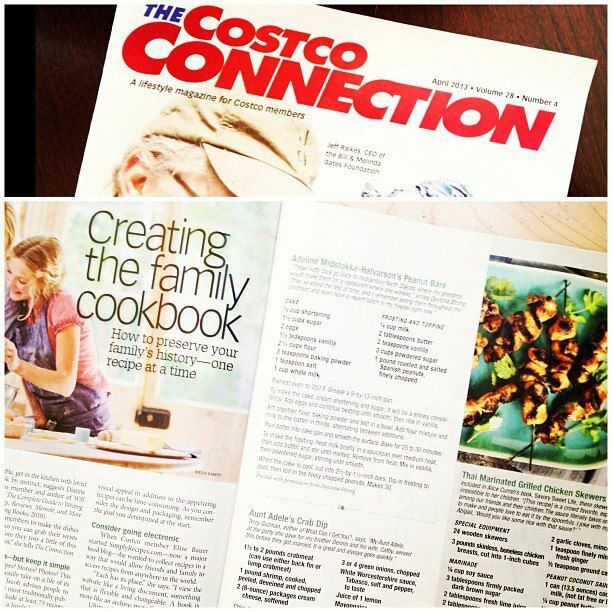 That article is published in the April 2013 issue, and if you happen to be a Costco member, you’ll find it on page 49. For the rest of you, you can read “Creating the Family Cookbook: How to Preserve Your Family’s History–One Recipe at a Time” in the online edition. You’ll find great tips and inspiration in the interviews with Dianne Jacob, author of Will Write For Food (a must-read for anyone interested in any type of food writing); Alice Currah, author of Savory Sweet Life and a blog by the same name; Terry Guzman, author of a self-published family cookbook called What Can I Get You; and Elise Bauer of SimplyRecipes.com. The article includes three recipes, including my Grandma Adeline’s peanut bars, which she’s been making since the middle of the last century when she baked them for a restaurant. I grew up eating these sweet and nutty confections, and I trust that you’ll love them as much as I do. This article epitomizes the current phase of my career, a time in which I get to have my “dream job.” When I started my career as a journalist fresh out of college, I envisioned a future of covering the news, eventually moving from my role as a writer and producer to becoming an anchor and reporter. Little did I know that I would eventually find my ideal outside of the newsroom and in my own home. Since leaving the traditional working world in 2011, I’ve begun freelancing more and more, transitioning from general news and features to writing about topics I’m passionate about: primarily food, Scandinavian cuisine, and parenting. Check out the article! I hope that you enjoy it and that if you’re working on your own family cookbook, that you find it helpful and inspiring. Image used with permission from Alice Currah. Love your articles! Im a native Norwegian and are trying not to forget all the wonderful traditional cooking my grand mothers used to do. In my blogg today you can read/see how I make traditional raspeballer! 🙂 I love to keep my “husmanns kost” alive! 🙂 Hope you`ll have time to check it out!